#3 - New 60 gallon American oak barrel with a low, deep impact toast profile. 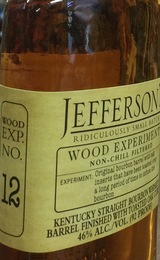 The inspiration behind Jefferson's Wood Experiment Collection came from Trey spending time in a wine cooperage in Missouri. Wine cooperages are different than what you find in Kentucky as they have different treating processes, which focus more on toasting, slow cooking, and searing to bring different flavors to the forefront. 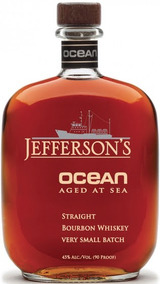 It was at this point we asked, "How could we change up what the final flavors of the bourbon are afterwe mature it in typical bourbon barrels?" 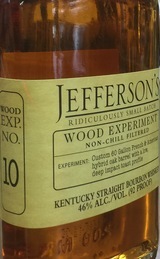 Trey startedby putting 4 year old bourbon that had been aged in new charred white oak barrels, and finished it in 13 different environments/vessels. There were so many combinations to experiment with - new bourbon barrels, new wine barrels, wine barrel heads on a new bourbon barrel, insert oak staves that have been seared, or oak cubes that have been slow cooked, etc. Over a period of 32 months, we charted the characteristics of each experiment monthly and analyzed how the different treatments have affected the outcome of the final whiskey.